Murtaza: भाई इस बार आएगा क्या ? Me: ऐसे कैसे हो सकता है ? Murtaza: लगता है Indi वालों को बोलना पड़ेगा कि यह पिछली 10 बार से आ रहा है , इससे कोई अवार्ड दे कर रफा दफा करो यहाँ से . So thats how the story started this time. It was my consective 11th Indi meet and all my friends were confused about my participation as unlike the previous time I had not declared about the meet on my facebook page. I came to know about it this time from Dipali. In turn I informed my B bar gang from the previous meet. The registrations this time asked to bring photo ids along as there were measures to keep unwanted participation out. Quite a few people have turned indi meets into family gatherings. One blogger registers and brings along the whole family turning it into a family picnic. Husband: Dont worry , I`ve heard that there is a Indi meet in town, lets go there. Dress up Sunny and Pappu too.. there is still time. So I knew that whatever measures Indi were taking this time would make sure that only the interested crowd turns up there. The only issue with the delhi meet is seats. There are so many interested people that its impossible to register at the last time. I too informed my gang. Arsh registered, Rahul couldn`t. There were quite a lot of my old pals I saw in the attendees list. I surely wanted to meet them. One day before Talreja called up to say that he got hold of one seat. As always it was yes from my side when Swati called to confirm my coming. Who said I will miss an Indi meet? In the morning, I saw one empty seat and informed Rahul... With so much desperation in the voice, he told me to register the seat. Oberoi has become a sort of known place for me, visited it quite a few times in the past for Indi meets and product launches that I really want to book a room there permanently... आना जाना तो लगा ही रहेगा . Left office some time early. I knew that if I stayed longer , boss would surely pile up work. From JLN metro station it was a walk just like the last time. I knew the way very well so i guessed that it wont take me more than 20 mins, so decided to kill time. Mind you that it was just 4 then and I had 1 hour to pass. As always my first buddy to receive my call – Jatin. “ आ रहा है न तू ?”. The question he knows I will ask always. Then next it was Murtaza, Talreja, Simardeep and Dipali. Sat down under a tree and observed the mad traffic rush with people driving AC cars and I was enjoying the nature`s AC. Headed to the Oberoi and in another 10 mins I was there. In the lobby started searching the known faces. Finally found Rahul Prabhakar. Then came the lot – Dipali, Sheetal, Manjulika, Murtaza, Yogesh, Arsh, Rahul. You cant win with ladies when they go crazy for pics and you are handed the camera work. Thank god that I didnt have to click the pics of Sheetal and Dipali- god sent Gautam just in time. ऐसे नहीं , वैसे खीचों , background आना चाहिए.. swimming pool दिखना चाहिए . It was another matter that the swimming pool was towards the left and they both were standing to the right. Now how can one snap that? Photoshop ? After a few mins. We headed towards the hall entry seeing the crowd buildup...and there was a queue with Nihal and Karthik both checking the names from the list and seeing the Ids. Just like you would find at any examination centre, “ सब लोग roll no. के साथ अपने अपने id निकाल लें ”. It took time but was worth it. Next we were stamped on our hands just like one would do in any club. Double verification layer. अब इसके बाद तो अपना मैदान है . On the right there was a huge background cutout of Nokia XL and people were being asked to pose for the cameras infront of that. With a bit of exhaustion from office itself, I was in no mood to pose... I need to be fully relaxed in order to be ready for these sort of crazy things. Our first objective – seat घेरो. Dipali was calculating how many of us were there- all friends included and then used bags , handbags to mark the seats and then we all moved to the juice counter outside and our craziness started with jokes, laughter like never before. It was just like in a train when a family goes for a family function you hear people saying , “ अरे Pappu, अपनी बर्थ कौनसी है ? ताऊजी यहाँ से वहाँ तक सब अपनी है ” . This is exactly what we were doing with the chairs and seating. 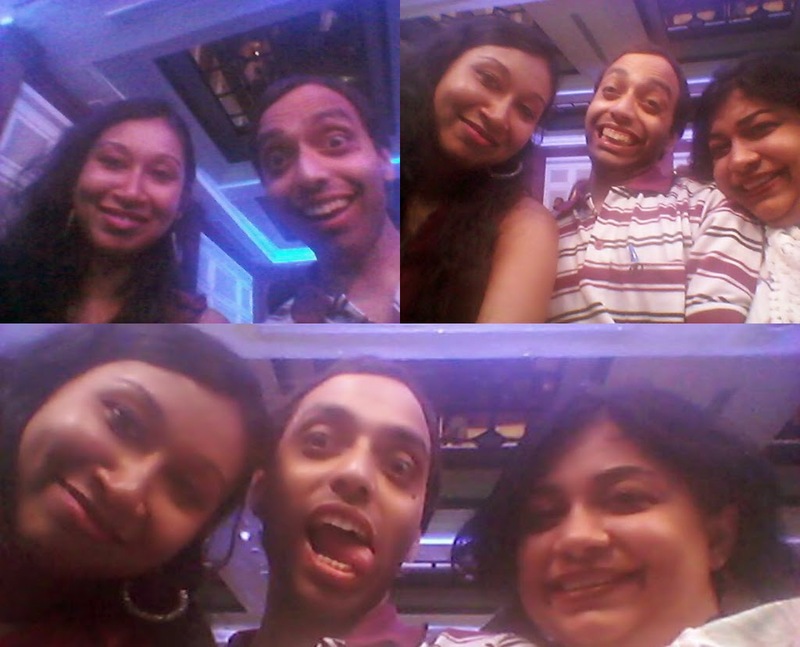 Group selfies, crazy poses...you name it and we had done it. Later on more joined us – Shilpi, Priyanka, Gurpreet ji etc. With glass juices in hand, we were literally fighting over chocolate cookies. Headed inside and waited for the things to get underway. For change Nihaal started the anchoring and welcomed us all. He then started with giving us all various trivia bits about each indi core team member. Then Anoop took over and the Ich will track started, the same one which was there in the JIFI meet. 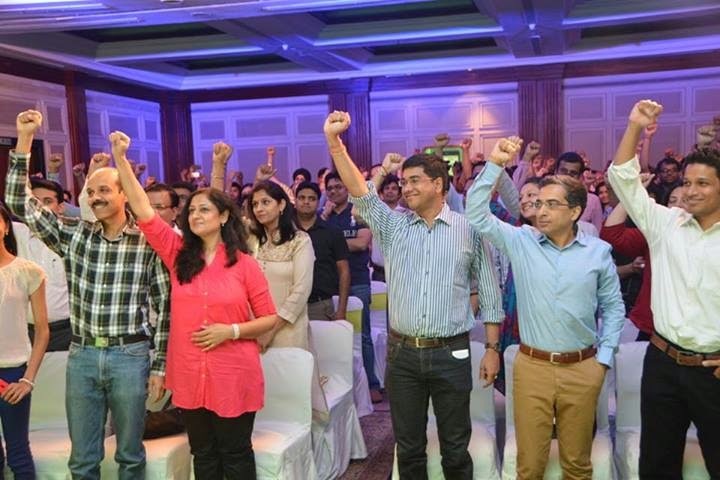 For a change, each and every Indi core team member was there back on the stage grooving, then it came back to the famous “ Hurr Hurr”. After this, it was 30 secs of fame – the intro part. Quite a few people came up with their intros. You have photographers, poets, techno people and all. I wanted to give my intro but then decided against it. 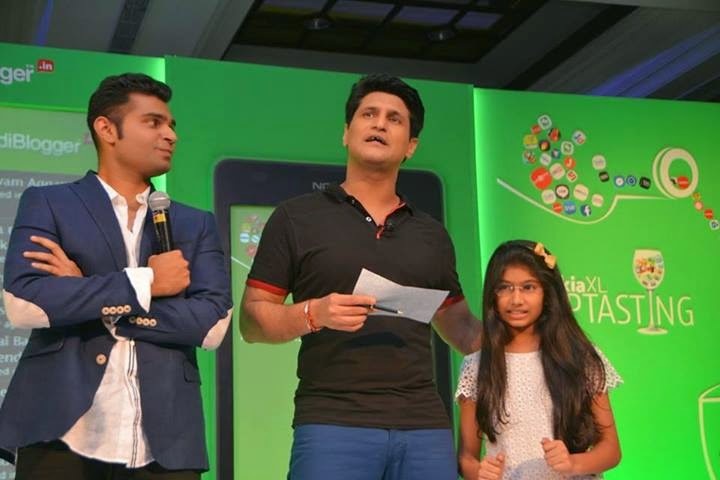 It was time over for Anoop as he welcomed Rajiv Makhni and Vikas Khanna. Rajiv was supposed to host, not Anoop. 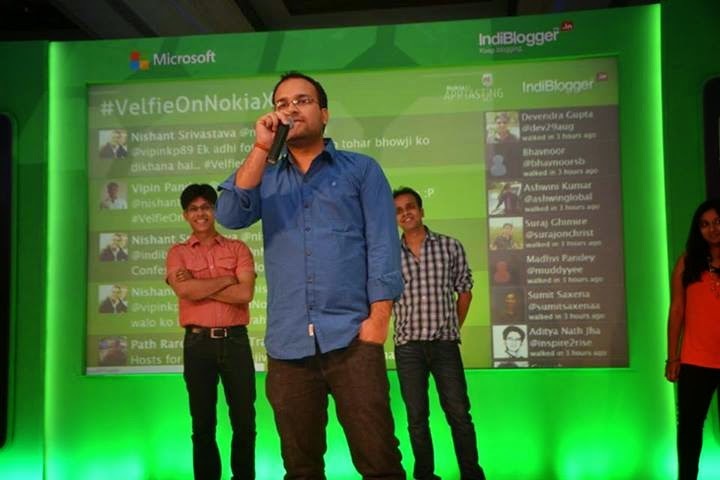 Vikas was looking a bit quiet, not the chirpy self I saw him in Jan. in the first nokia meet. Rajiv told us that he was there despite a fever of 103. Now thats some endurance standing on the stage and maintaining a great level of concentration. Hats off to you. 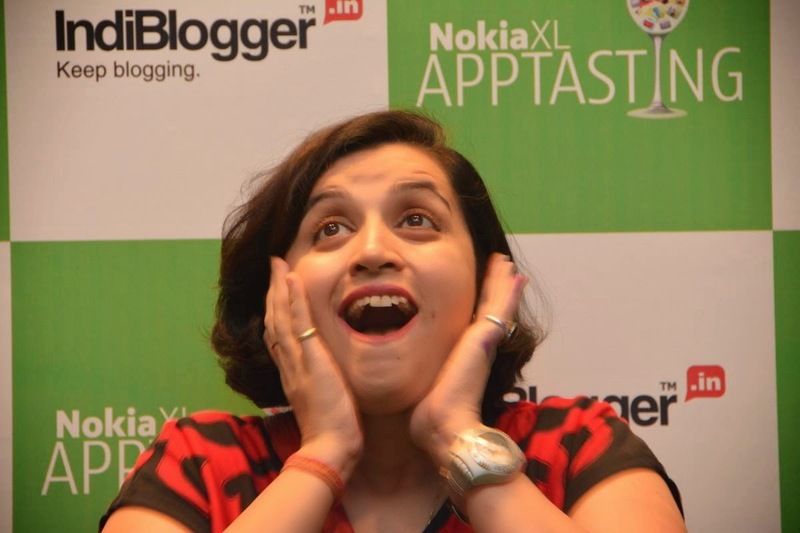 Talking about the Nokia XL phone and the various apps, Rajiv asked us what we thought was not possible in the Nokia which was there in other android powered phones? Depending on the responses he got regarding apps, he asked us to name a new kind of selfie and describe what it would be. With various responses , the best chosen one on the response given by a lady- the winner was “Packalfie” – apply face pack and click a selfie. 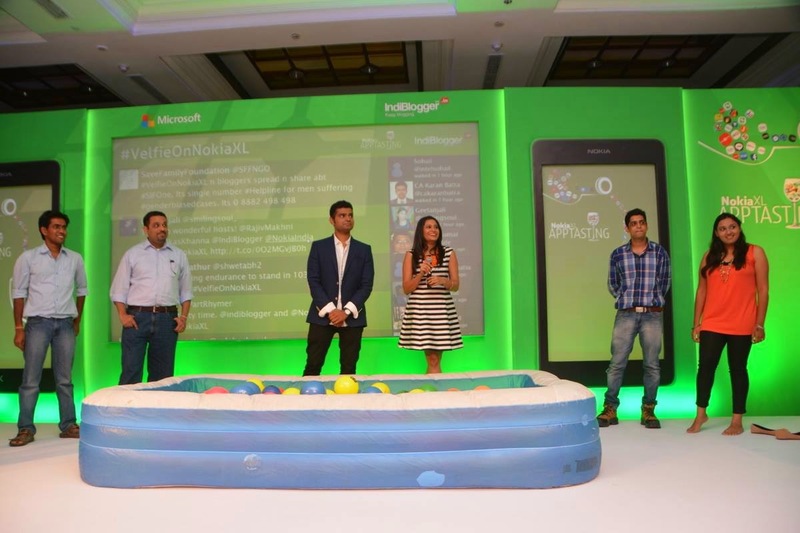 Next activity was to demonstrate the ease of downloading of apps on the Nokia. So 5 people were called up, an inflatable tub filled with platic balls with various app names were put inside it. Some anchors of a current ndtv show were called on stage and asked to host that part of the activity with Rajiv. 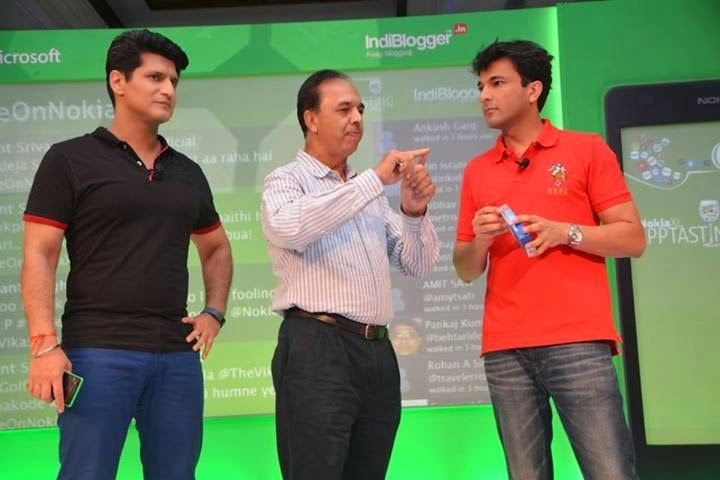 One thing is clear- the anchoring part is best done by either Rajiv Makhni and Vikas Khanna or the Indi team. Rest are all bakwaas. Now one by one all the 5 people were asked to dive in the tub in the most spectacular manner, without spilling the balls out of the tub and pick up one ball with an app name. So we had people jumping, sliding, falling in the tub. After it was done, all 5 names of the apps were quickly downloaded on the nokia phone. I was literally yawning by this time. The activities failed to generate any interest till now. Maha pakau. Basically every activity was all about some 5-6 people coming for an activity, winner going away with Nokia XL and the rest getting a portable USB charger. The audience could only sit and watch ( thats why I love team activities). Till now I was clicking crazy pics with shilpi. The boring the activity, the crazier my pics. Next was the showcase of the multitasking activity of a phone. 3 people were called, handed a t shirt and were asked to put them on with one hand while using the other hand to make a video of the other person while the t shirt was put on. 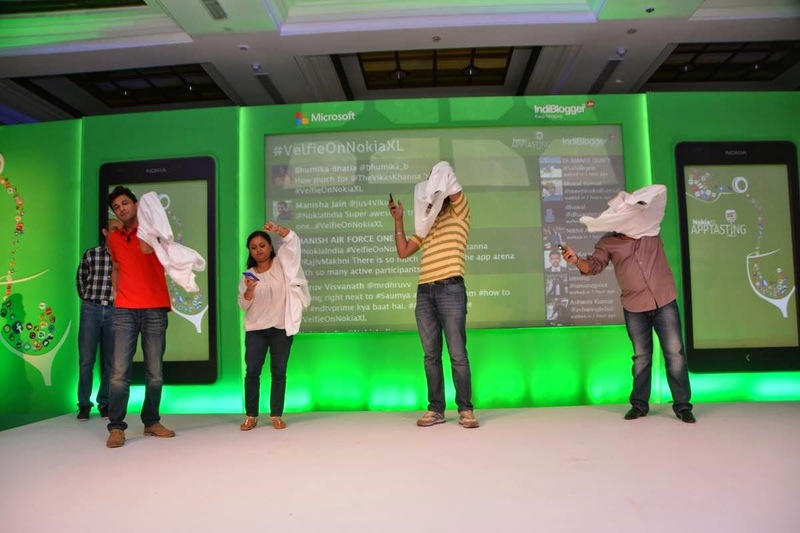 To make it even, Vikas was given a t shirt to put on without the video. Its tough and goof ups happened and there was another go at this activity. Not to mention that there was a bet that Simardeep could do it the fastest and the most properly but unfortunately he couldn`t. In the retry attempt too he just couldn`t beat another person. He walked away with a charger. In the previous nokia meet also he had got the same prize. कुछ ही टाइम में Indi से मिले chargers की दुकान खोल लेना यार . There was some talk about Rajiv being married and he responded in the most brilliant way, “ I wont tell you that, meet my daughter Amaya”. A lot of people were stumped..ha ha. Now this activity was interesting. It was a roti making activity- Vikas`s domain. The persons for this activity were to be chosen by Amaya and to help her Rajiv told her jokingly “ Choose the one who gives you chocolates” . He thought it was the easiest thing to say. He didnt knew that he really played into Gautam`s hands or I should say that my bag. I had just "wasooled" 2 dairy milk silk from Dipali for some work I had completed for her. I said to gautam, “मेरे पास chocolate है ” and handed him one. He literally bribed Amaya to choose her right infront of so many people. Rajiv saw the chocolate and told her “ Take the chocolate but dont choose”. He was wrong. Gautam went in on the basis of the chocolate. In 2 mins. the 5-6 people on the stage had to make a perfect round, big roti and Vikas would choose the winner. Amaya was a participant too. In 2 mins we had maps of a few countries, big rotis but a bit of holes( gautam), some perfect but not big enough. A lady won it but one uncle ji was adamant on the step motherly treatment as he had doled out the perfect round roti. I cant comment on that. Now a fitness activity. A kid and some people were called to test an app once again. The kid was asked to verify his age (jokingly though), his mother testified. The difference between his age and the oldest person was calculated ( which was 2.5 times). 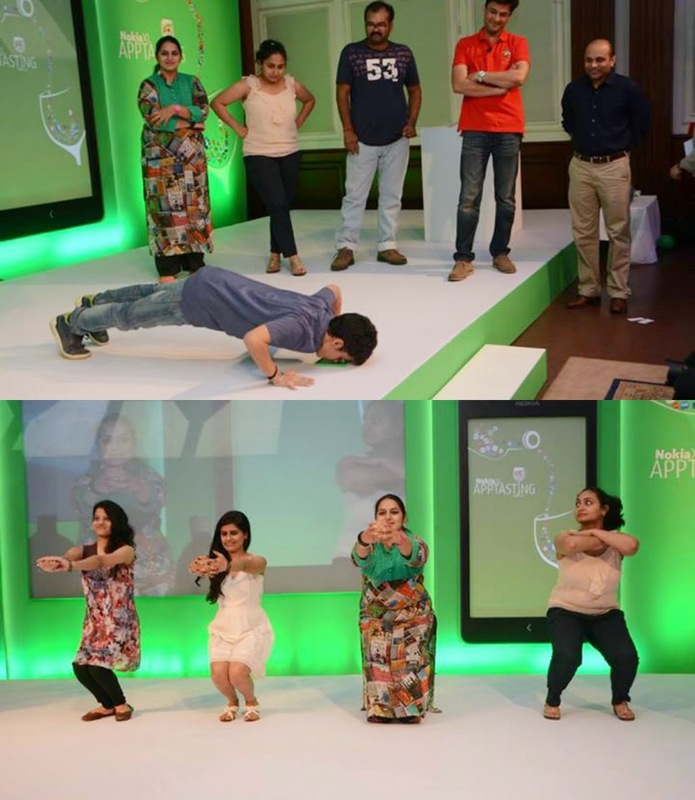 The pushups by the boy (20) and the oldest person – our poet Saini ji ( 9 required to win) was the criteria to move in round 2. Rest were all ladies so this activity was not for them. Saini ji could manage only 5. Out of contention , in round 2 the people were asked to do sqauts. 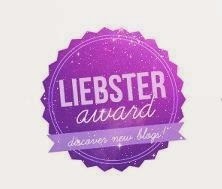 The one who kept the posture with the balance intact won this. This went to a lady. I had no clue what the app was supposed to do in this case. I am not that much attentive in this regard when i am thinking and doing something else. Why did you write what you wrote?? At the start of the meet we were given visiting card sized cards with the words that why NokiaXL is bigger and there were fill in the blanks then. 5-6 cards were chosen by Rajiv and the these people were called on stage and asked to explain what they had written and what was going through their minds when they had actually written that. Everyone had written the word bigger and then the word was open to the various interpretations ( in whichever way you can think). With some really interesting backstories – marks, affairs, boyfriends, the grand prize went to a Sardarji( who was out there drinking when his name was being called). 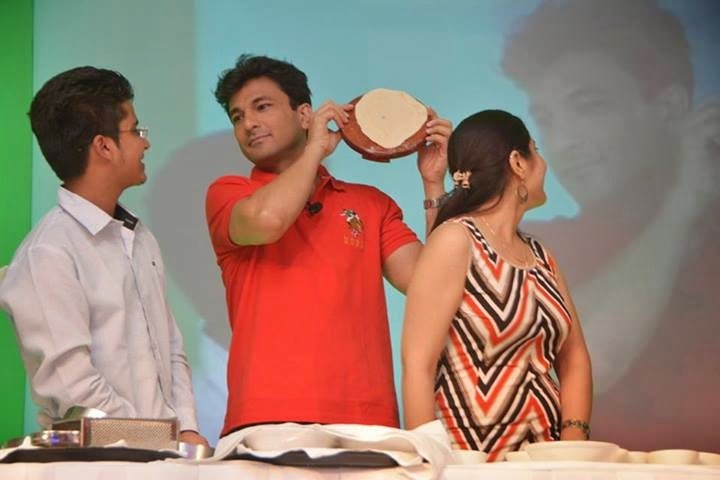 The next activity was also a Vikas Khanna special. He was asked to choose people but instead of that happening, people shook his hand and walked on stage themselves. Now thats amazing. People were inviting themselves. 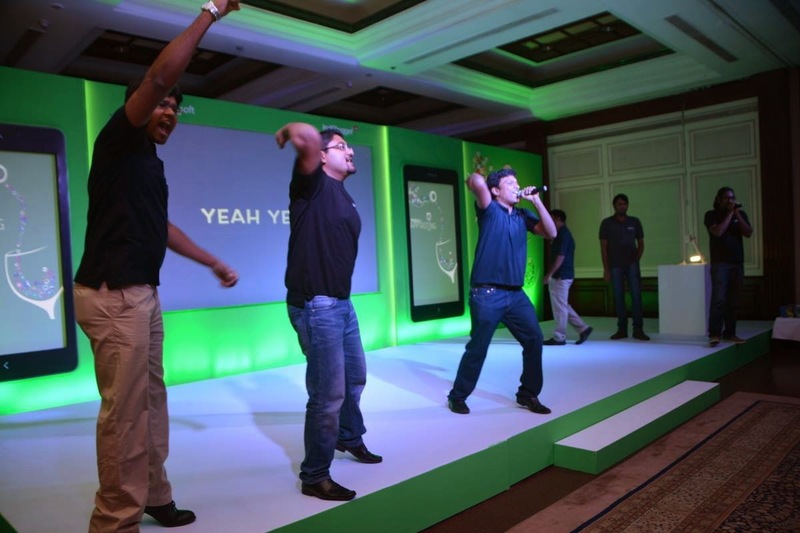 Jatin was too eager as he was the first person to walk on stage even before the activity started. 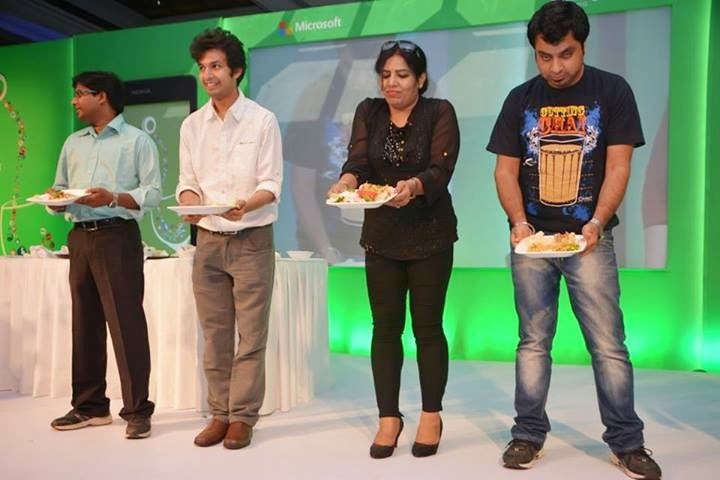 Instead of the needed 5 , 7 people gathered and Vikas had to ask them to name an unconventional dish using an item he spoke. अब खाने की बात हो तो how can be Talreja behind ? He made up धनिये का साग. 2 people were eliminated as one spoke up pizza and another something else. The activity was to arrange a dish most creatively by using the items on the table. Time was 2 mins and all 5 got down to work really fast with grating, cutting. Amaya as usual was busy observing and the decision was Vikas`s. The one who had named his dish as Aloo chaat won as his was the most asthetically pleasing dish. Next were showcasing of 2 apps- The profanity buzzer ( beeps when cuss words are used). I doubt its success in Delhi. यहाँ तो बात शुरू ही तेरी माँ , बहन से होती है . This app is a flop for India. Next was a alcohol level testing app which measured the level of alcohol in the body when you pressed your thumb at one particular spot. Dont know who made it through. The fun came afterwards when the uncle from the roti making round came again to question, “ उसकी रोटी मेरी रोटी से गोल नहीं तब भी जीती कैसे ?”? Another person hogged the mike to speak on environmental issues. Give us a break..He should have done that at the intro not when its about to end and people are looking to go back home. Things got crazier for me after that as I was virtually on multitasking mode. Had to rush to take Vikas`s autograph ( my didi`s special demand). Blogger हम और demand उनकी पूरी कराएं . Knowing that he was not well and would leave soon, had to give a miss to a personal photo with Rajiv. Got fortunate that despite his health, Vikas obliged me. When I went back to the stage, remembered the T shirt ( had missed it the last time). Rushed to take that with Sheetal alongside me. Dipali kept searching me for the photo. अरे T shirt तो उठा लें पहले . 3 mins in the line, munching on the papads given to us by our very own Dr. Sahab, we were done. Now headed inside for the photos with the whole gang. After it was done, out for dinner and saw Arsh and Rahul with loaded plates just like a shaadi and decided to join them there. Why bother with a new plate and the hassle of food again? Sheetal lost in her own thoughts headed for the exit. I kept calling her but she wouldnt listen. Joined by Yogesh bhai we 4 got talking and in between I asked him for a lift to the metro station. Faridabad was surely not in the list of Indi buses. Simar came and told me to see Yogita. When I headed to the girl`s gang, “कैसे जा रहे हो ?” Told her about the lift and she too hopped in alongwith her brother. There Yogesh bhai was anxious to get home as children were waiting and you can imagine the scene. He was telling me to hurry up, I was saying goodbye to people, assembling Faridabad people ( by then Rahul bhatia, rathore, Arsh had also joined in), even then we were clicking pics, having desserts (I was photo bombing pics). Finally in an Esteem we were a total of 7 people stuffed together. Yogesh bhai was driving, Me and rathore on the front seat, Rest all in the back. Resisted the urge to call out , “ Metro, Metro, Metro”. I guess a lot more people would have joined in on the roof. The most hilarious moment came the next day when I asked sheetal why din`t she stop. “अरे यार मुझे पता नहीं था कि dinner कहाँ है , सब कह रहे थे की drinks चल रही हैं तो मैं चली आई ”. I mean how much hilarious can this get now?? A girl walks through a hall filled with people holding dinner plates at every mm and she doesn`t see food. How much more forgetful and lost in the thoughts? ग़जिनी के आमिर को भी मात कर दिया रे . Thats what happens in Indi meets when craziness is of the top level.